And you thought your Hyundai had moves. 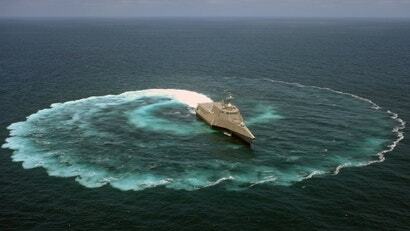 This is the littoral combat ship USS Independence showing off its turning radius last week. Technically,it's a display of manoeuvring prowess, but you can't help but think it was also a chance for a bunch of able-bodied seamen to say wheeeeeeeeeeeeeeee. Now just imagine the damage this guy could do on a lawn.